I don't know if I have the words to capture half of the beauty that happened todayon our Beautiful Truth Retreat. I am learning that something extraordinary happens whenever women come together in a small group to talk and learn. Something so powerfully beautiful that it feels a privilege just to be a part of it. Yesterday some of us met for the first time. Today, dare I claim it ... we're friends. It has been an intense day. It's only 9.42pm as I write this but I could easily sleep now. This morning we gathered for breakfast ... a divine breakfast of fresh fruits, Italian coffee, tea, muesli, and pastries. Freshly-squeezed orange juice too. Then there was a photography workshop with me ... out by the pool. It was made up of more than a little laughter and many photographs were taken out there in the blue-sky summer's day that was today. But then a most extraordinary thing ... we jumped in the car and headed off to Carla's restaurant. 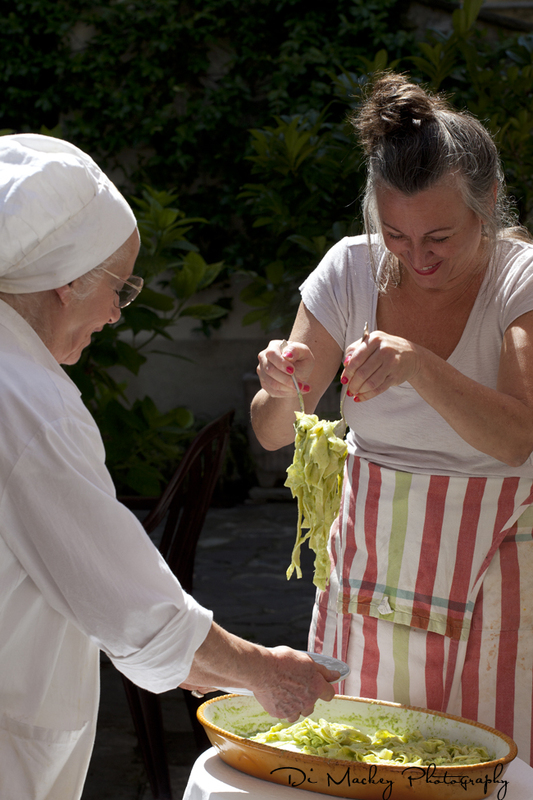 We spent the next few hours learning how to make pasta and bruschetta the old-fashioned way ... no machines. Carla made us all smile as she opened a bottle of some divine Piedmont white wine and we began with a toast. Of course, as the hours unfolded, there was more laughter and so many courses of beautiful food that we almost had to be rolled away from the table. There was bruschetta, a pesto cream sauce for our handmade pasta. There was this turkey, pot-roasted, in sauce made from its juices, some cream, dried mushrooms and other secret ingredients. Some of us could have attempted that as the soup course. The gravy was divine. And we ended with a bowl of plain gelato ... no flavour, not even vanilla just gelato and I had never tasted anything so good. And understand, I could have stopped with the bruschetta, I definitely could have stopped after the pasta. But I ate it all, well most of it, like everyone else. And like everyone else, I left having absolutely fallen for Carla. She hugged and kissed us all when we left and, I think I speak for everyone, when I write that we left feeling like the sun had been shining on us ... just us, for those hours spent in her company learning those everyday things that meant so very much to us. Dinner tonight and we gathered in the kitchen, a selection of beautiful Italian meats and vegetables there in front of us, some red wine ... all of talking, and laughing. I needed this laughter. Life so serious so often and to gather with these women who simply astound me ... it is good. Perhaps the photograph that follows captures a little of fun of it all. Then again, I said quite a lot ... didn't I, writes this bemused woman, hoping she will be forgiven for raving, again. There is more, there was the visit the ancient home of an artist, his lovely architect wife, and his film-making son. But I don't dare try to add that on here. That story is a whole other post. The photograph below ... Diana and Carla, serving up the pasta we made.